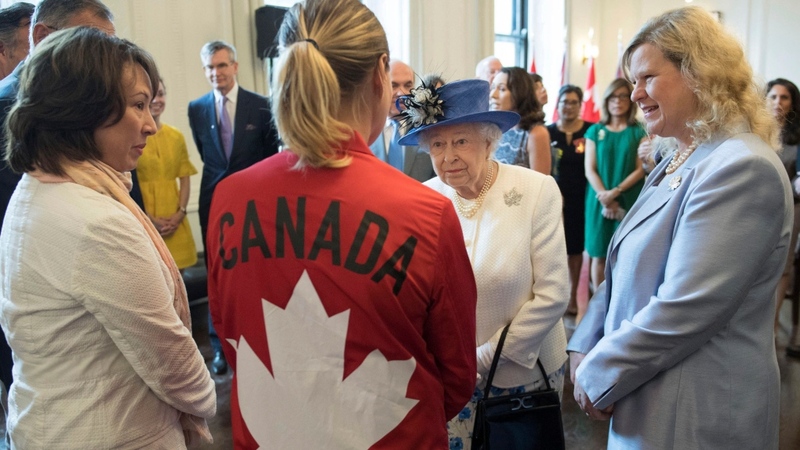 This morning I was honoured to be a guest at Canada House, where I had the chance to talk briefly with HM The Queen (that’s me lurking in the background of the photo, behind the Queen’s shoulder, in the blue dress). I was able to tell her about the change that is happening around the world, as more communities access human rights education and are able to make the choice to stop cutting their daughters. She mentioned how widespread the practice is, and we talked of how 200 million women are living with the devastating impacts. It was not an everyday conversation! It also gave me a chance to talk to others and to note that Canada has had a flurry of media on the topic of female genital cutting over the past few days. Last Friday, the Toronto Star reported on an article stating that Canadian girls are being taken abroad to undergo FGC. The article criticises the Canadian government for having done too little to understand the scope of the problem and for lagging far behind other countries in efforts to prevent it. On that same day, the Star also published an interview with Yasmin Mumed, the first Canadian FGC survivor to publicly speak out about undergoing the practice. The interview was accompanied with the clear message that Canada lacks local services for women who have undergone FGC, as well as appropriate training for professionals who interact with FGC survivors. The critique that Canadian health professionals lack appropriate training is repeated in another article on FGC by The Star, published on Monday. This article elaborates that FGC survivors living in Canada who seek deinfibulation are often received with surprise by Canadian doctors who have no knowledge of or experience with FGC. Medical doctors say that too little is known about the practice among health professionals, and that Canada lacks data on the prevalence of FGC among women who arrive to Canada. Also on Monday, Global News reported that the Canada Border Services Agency has been on the alert for the arrival of travelling ‘practitioners of female genital mutilation’ for more than a year. Thus girls and women are not only travelling abroad to undergo FGC – as described in Friday’s article by The Star – but they are also undergoing FGC in their homes in Canada. The Star’s Editorial Board repeated many of the above arguments in an opinion published on Monday. It stated that other countries, such as the United Kingdom, are ahead of Canada in gathering data on FGC and fighting the practice and that a government that proudly professes itself to be feminist can and should do more. The article concluded that, while the Minister for the Status of Women, Maryam Monsef, and the minister for International Development, Marie-Claude Bibeau, on Monday condemned the practice of FGC as “a form of gender-based violence that our government is committed to addressing both at home and abroad,” the measurements taken so far fall short of what is needed. The Star continues to urge the Government to take more action and published another article on Tuesday, summarising previous articles and repeating that the Canadian government must do more. We agree that more needs to happen and we are keen to ensure that survivors, civil society and the media engage more with the topic, given the government has taken quite a few steps forward over the last year. We are hopeful that the level of debate beginning to emerge will lead to more further progress.